I feel like it’s fair to say that most people know the story of King Kong. Boy meets girl. Boy falls for girl. Giant ape takes girl into jungle. Man saves girl. You know, that story. This is where it all began, however, in the year 1933 with its original release. Studios weren’t too excited about getting this movie made since the executives thought that a story like this wouldn’t make them any money. Directors Merian C. Cooper and Ernest B. Schoedsack, on the other hand, were determined to get it made. With two years of their lives dedicated to this movie, audiences both then and now get the pleasure of experiencing one of the most inventive and exciting movies ever made. Carl Denham (Robert Armstrong) is a big shot film maker who specializes in traveling to exotic locations to get the most interesting shots imaginable. He finds the beautiful Ann Darrow (Fay Wray) on the street and recruits her to come with him and his crew to Skull Island to shoot his most recent film. On the ship ride over Ann meets Jack Driscoll (Bruce Cabot), and they both fall for each other. Once they are on Skull Island, the crew runs into the natives who prompt kidnap Ann and offer her to their god, Kong, a giant gorilla. Jack and the crew lead an escapade to find and reclaim Ann, but Carl has another goal entirely: to capture Kong and bring him back to New York City and make millions off of his prize. The first thing that I need to touch on is the outrageous special effects that are in King Kong. In Peter Jackson’s version, which I really enjoy despite a run time that is way too long, Kong, the dinosaurs, and a lot of the scenery was done through the usage of computer graphics. 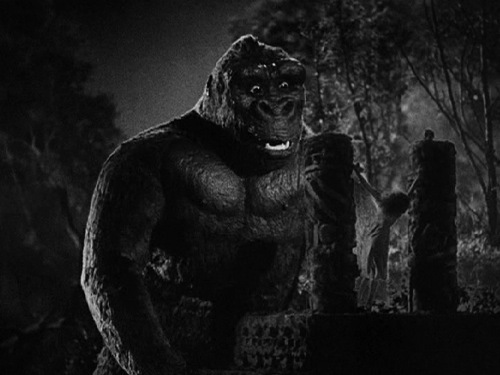 In the 1933 version, all of Kong’s movements, the dinosaurs, and the jaw dropping fights that happen between them is all stop motion effects using models that were made and moved by hand. Giant limbs and heads were also built for close ups of Kong that strike me as a little off putting compared to how awesome the full model is. The forest is also all built or drawn and is absolutely mesmerizing. Finally, to make it seem like the actors were actually there during some of the major moments of the film, they would composite the actors in, super impose, use matte shots, or use rear projection. All very difficult, all very time consuming. Now, I don’t want anyone jumping down my throat here. The work put into the computer graphics of Jackson’s King Kong is also remarkable and very difficult. I’m just a bit of a freak for stop motion and puppetry. While the effects are my favorite part of the movie, I need to touch on the story since it has become a classic tale. The whole idea of a giant ape taking a woman away who is part of a film crew sounds pretty preposterous when put that way, but when you actually see it play out, it’s actually a very touching story. Sure, there’s a lot of action and adventure, but Kong’s character is a very interesting one. He’s an ape who understands beauty and will fight and kill to protect the woman he finds so beautiful. Certainly not a love story in the most traditional of senses, but definitely a deep one. While Kong may seem like the “villain” (and I’m using that word pretty loosely), we find out during the film that mankind is the real “villain.” Denham and his crew want to exploit beauty, but Kong wants to appreciate and cherish it. The story of how this plot line came to be is pretty remarkable when you stop and think of the history of it. 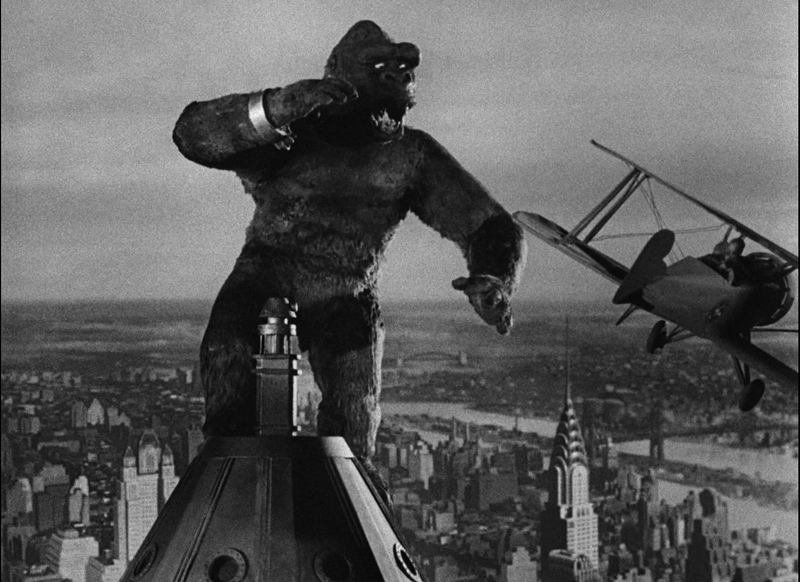 From 1933 to 2005, there has been two other King Kong movies and a sequel, Son of Kong, also from 1933 which didn’t do nearly as well as its predecessor. There was even a Toho produced movie that is wonderfully titled King Kong vs Godzilla. How cool is that? Anyway, back to how the story came to be. According to Merian Cooper, he had a dream that a giant gorilla attacked New York City. From there, he started at the infamous scene on the Empire State Building and worked backwards. So that’s it. The idea for this movie simply came from a dream. Maybe I need to start keeping a dream journal. Food for thought. I can’t call this a review. With each viewing of Orson Welles’ incomparable masterpiece, I find something new to find, enjoy, think over, and then talk about. Citizen Kane has been called the greatest movie ever made by many, many people. To me, there is no argument. It is absolutely the best film ever to be made. This doesn’t mean it is my favorite. I’m talking about objective vs subjective. There may be a song that I dislike, even though I know that it is objectively well made and performed. So, even though there are many people who would argue my claims to this being the best, I will present my reasoning. I’m sort of surprised that I’m not completely sick of this movie. There isn’t a class that goes by where Citizen Kane isn’t mentioned, referenced, shown, or compared to at least once. Every frame offers something new and exciting, especially at the time when it was produced. Orson Welles, who was only known for theatre and radio performances, never dabbled in the cinematic world at this point in time. He was still a very well known individual, especially after the whole War of the Worlds scare. 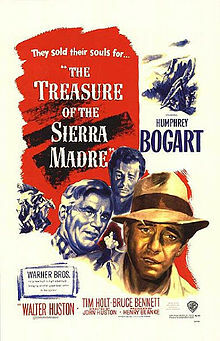 RKO gave Welles complete control over this project, which he took full advantage of. He is the producer, director, co-writer, and star. That’s a lot to juggle, but somehow he pulled it off. Coming from a technical stand point, this is really an amazing movie. It it weren’t for all of the work and innovation injected into the film by Welles, the cinematic world would be different than it currently is. Before this point, classic Hollywood movies had a very strict structure on how to make a film. Wide angle lenses were used for establishing shots and large scenes and telephoto lenses for the more intimate moments. Welles takes these rules and completely rewrites them. Citizen Kane is almost entirely shot with small, but very wide angle lenses. This makes the depth of field in these scenes very great. One excellent shot towards the beginning of the film shows a young Charles Foster Kane playing outside in the snow. The camera moves further away from the window to show his parents talking to Thatcher. Charles is still seen clearly through the window even though the attention is place on the dialogue. The scene moves even further into the house when Mrs. Kane goes into the dining room. The camera moves with her, and even though Charles is so far in the background outside of the house, he can still be seen clearly. Instead of making this an intimate story about Kane’s rise and fall, the audience is kept at a distance, acting only as observers in his life. This also makes the settings feel very spacious and grand, leaving a lot of room for emptiness, much like Kane’s own life. Even if you haven’t had the stunning pleasure of seeing Citizen Kane, you probably still know about the famous line that actually only consists of one word: “Rosebud.” The mystery of who or what Rosebud is is the driving force behind the movie, but isn’t what the movie is about. Citizen Kane tells the story of Charles Foster Kane, a newspaper magnate who at one point seemed to rule the world. His downfall happens just as his rise, gradually but defined. On his deathbed, Kane utters the word “Rosebud,” which leads a reporter on a hunt to find its true meaning. The mystery of Rosebud allows the viewer to get a look into the history of Charles during the most important times of his life. Another huge innovation that is getting more common in films today is its disjointed narrative. 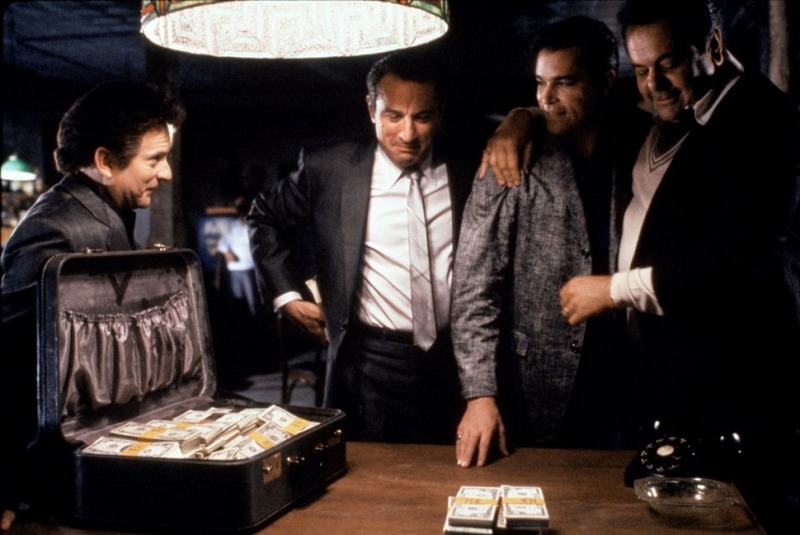 The film pretty much begins at the end, but pieces together all of what happened before in flashbacks that are started by different associates of Kane talking about his life. This is a much more effective way of telling a story like this. By the end of the movie, my experience is that of loneliness. 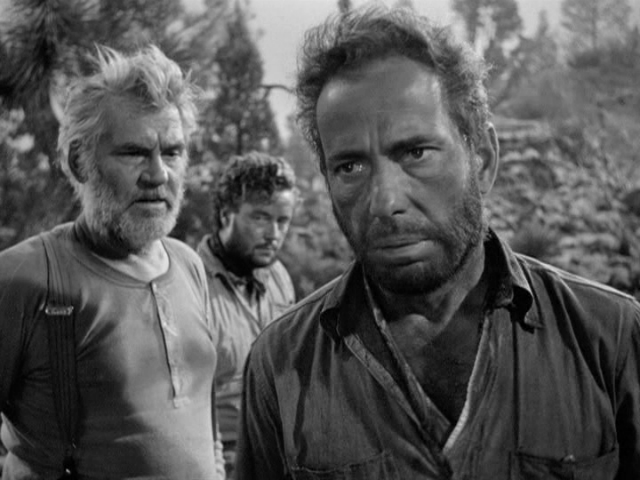 Combining the technique of using wide angle lenses with the entire drama of Kane’s life creates an air of longing and hopelessness. To top it all off, the answer to the Rosebud mystery is one of the greatest revelations in the history of cinema. Without spoiling it, although I’m sure most people who haven’t seen it know what it is, the revelation is shocking and sad. Why Kane was thinking of this at the time of his death poses many questions. The main one is: Why? Was it because it represents a time in his life when he was truly happy, or is it just the random last thought of a dying man? The whole thing seems pretty pointless. The final shot of the movie that shows the fate of Rosebud only adds to the idea that what we are on earth, and how we spend out time here is meaningless. Kane’s belongings are being packed up and sold and his only remnant of happiness is lost forever, which means nothing that describes the best of Kane is left. In a way, however, the audience shouldn’t feel bad for Kane. Everything that happens to him in the movie is a result of his own actions. The morality that is presented in the movie is clear along with Orson Welles’ view on particular individuals. Although this theory is still debated, and Welles himself has come out and denied it, it seems apparent that Charles Foster Kane was based off of real life newspaper magnate William Randolph Hearst. Hearst was very displeased with the way that he felt he was being portrayed and campaigned heavily against the film. He prohibited any advertisements for Citizen Kane to be printed in his newspaper, and even refused to endorse any other RKO film. Welles defended the film saying that he meant for Kane to be a conglomeration of many different leaders and businessmen into one character. The questions is: Did he mean this or was he just covering his tracks? Although it was nominated for multiple Academy Awards, all of the controversy that the film and Orson Welles stirred up set Citizen Kane up for some major losses. The only Academy Award that the film received was for Best Original Screenplay, which is great but it deserved so much more. Whenever Orson Welles or Citizen Kane were mentioned at the ceremony, everybody booed. That couldn’t have made Welles feel too great, especially it being his first film using actors who were known for the theatre and not the screen. Everything seemed to be against him and his film, from a terrible box office turn out to only being released in limited theaters. In a way, Hearst won, but only for the time being. Now, 72 years after Citizen Kane was released, it has become a film that is worshipped in its own way. The spectacle of it may seem a bit dated by today’s standards, but what you have to remember is that when this movie was released in 1941, it was groundbreaking. The technical proficiency, Gregg Toland’s cinematography, the way that narrative is organized, and I would go so far as to say Welles’ performance of Kane. One scene that has really stood the test of time, in my opinion, is a scene where Kane destroys a room. It was shot in only one take, leaving Welles’ hands bleeding. He claimed to be really into the scene and it was perfect on the first try. Many other scenes make this an incredible movie that is cherished by many and studied by those who want to make this their life. To describe how I truly feel about Citizen Kane, let me just say that it is the perfect example of a movie. It is Hollywood in its purest form, with a studio putting faith in an artist who has a specific vision which is accomplished. It wraps up a very human, American story in a way that is satisfying, but will leave you feeling emotionally empty. If someone never saw a movie before, this is where you would want to start them off. I can’t imagine that Orson, his cast, and his crew knew they were making a film upon which all others that came after would be built on. This isn’t my favorite movie, but it is the best one to ever be made. It’s hard to imagine one that will top it. 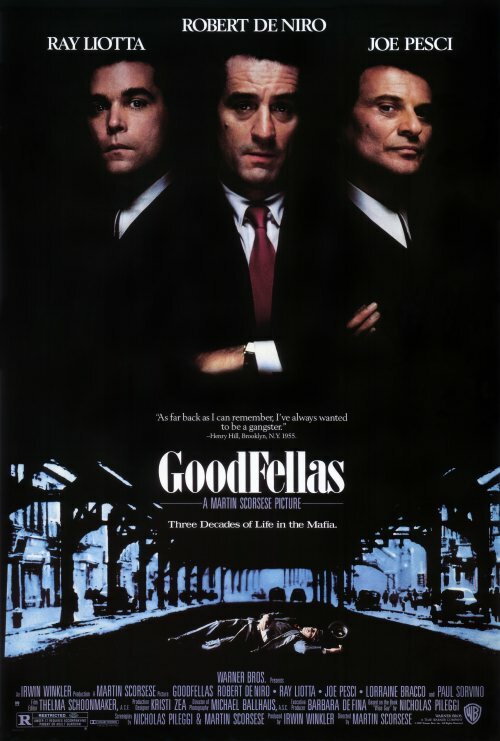 The only one that has ever come close is The Godfather: Part II. I hope that I’ve done this film and Mr. Welles justice with this, and I feel it’s my duty to say that if you haven’t seen Citizen Kane yet, than you don’t really know just what it is to watch a movie.